Could anybody work on the programme back then? The Doctor and Romana are en route to Gallifrey. Sue: That must mean two K9s this week. How exciting is that? I bet they’ll conduct an extensive analysis of each other’s arses as soon as they meet. However, Romana doesn’t want to go home. Sue: Poor Romana. As soon as she gets back, she should steal a TARDIS and bugger off again. I really like her outfit this week. It’s very Romany, which is appropriate, I guess. The TARDIS begins to shimmer and shake. Sue: It’s the Black Guardian. It must be. But the anomaly soon passes and the TARDIS arrives at its destination. However, even though the scanner displays images of their home planet, the TARDIS has landed somewhere else entirely. Sue: A gay nudist colony by the look of it. She’s referring to the people swimming in a nearby river in what looks suspiciously like their pyjamas. Sue: Is this Gallifrey in the distant past? Do these people evolve into Time Lords? Me: You know how the Doctor said we aren’t on Gallifrey? Me: That’s because WE AREN’T ON GALLIFREY! Don’t worry, she’s referring to Varsh, although a boy named Adric does warrant her attention. Sue: I’ve seen him somewhere before. I’m sure you’ve mentioned him. 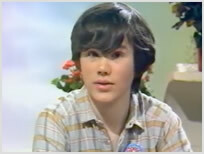 Adric… Adric… The name rings a bell. On a crashed Starliner, a scientist named Dexeter is examining a slide under a microscope. He’s especially worried about Mistfall, and a spider-like infectious life form. Sue: Are you scared, Neil? I know what you’re like when it comes to spiders. Suddenly, the river starts to bubble and boil. Sue: It’s like this all the time at Seal Sands. You know, next to the ICI plant. Two swimmers get into trouble and have to be pulled out of the river. Sue: Wait! They’re stark naked! Not for kids! Luckily, the boys are wearing pants. Very skimpy pants. Sue: They may as well be naked. This doesn’t exactly leave anything to the imagination. Not that I’m complaining, mind. 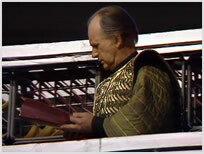 Adric steals some river fruit. Sue: Where is he going to hide those watermelons, exactly? Is he going to pop them down his trousers? Adric is pursued by a Decider, but the old man ends up flat on his back. Sue: He never touched him! He committed suicide by throwing himself into a backwards somersault. I’ve seen Jurgen Klinsmann fall over more realistically than that. The Outlers (Varsh, Tylos and Keara) seek refuge in a cave. Sue: Did they get this lot from the same stage school? Was it a special bulk deal? As the mist begins to fall, the planet’s inhabitants make a dash for the Starliner. Sue: It’s only a bit of fog. Can you imagine what this lot would be like if it snowed? Not only is Adric back on his feet, a wound he sustained to his knee earlier has almost disappeared. Sue: Is Adric Wolverine? Has he got healing powers? 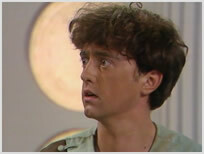 Me: Yes, you’ve hit the nail on the head – Adric is Wolverine. The episode concludes with an army of Marshmen emerging from the river. Sue: Ooh, I really liked that. Things are starting to pick up. The Marshmens’ entrance still looks good the second time around. Sue: It’s shot on film, the director is using some interesting angles, and the mist really helps to sell it. Yes, this isn’t bad at all. 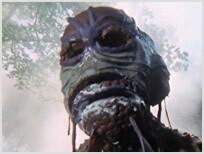 The monster costumes look like they’ve been made from bath mats, and it seems as if they’ve got custard skin hanging off their heads, but it’s still very good. There are lots of them too, which is nice. Incredibly, it isn’t until Part Two that Sue criticises Matthew Waterhouse’s performance. Is that a new record, I wonder? Sue: It’s his eyes. They’re darting everywhere. He’s as stiff as a board, too. He looks very uncomfortable when he doesn’t have any lines to say. Unfortunately, he looks even more uncomfortable when he does have lines to say. The Doctor tells K9 to follow the Marshmen. Sue: Is that K9’s theme music, now? It’s a bit funky. Meanwhile, the so-called Outlers have infiltrated the TARDIS. Sue: How did this lot get in? Me: The TARDIS door must have been left open. Sue: For ****’s sake! When will they ever learn? It’ll be the Black Guardian who waltzes in one day, and then they’ll be sorry. Where the hell is the Black Guardian, anyway? Sue: It’s lovely seeing K9 out and about, even if he is accompanied by a silly theme tune. The Outlers try to overpower Romana and fail miserably. Sue: The director – who’s very good by the way – isn’t a fan of Adric. Me: How can you tell? Sue: He’s framing all his shots so Adric is hidden behind the other actors. It cuts down on his blank stares, I suppose. How did he get this job anyway? Sue: Did he sleep with John Nathan-Turner? Is that it? Me: I know he had a letter published in Doctor Who Weekly before he got the part. Sue: So he was a fan, then? Me: Yes, him and the writer, Andrew Smith, were both fans. Sue: Really? Could anybody work on the programme back then? Decider Nefred seeks solace in the Starliner’s Great Book Room. Sue: He looks like he should be working at a bowling alley. The slots behind him are where you store your shoes. Sue: Do they swap Romana for Adric? They don’t do they? He’s a companion, isn’t he? He must be. I’ve heard you and your friends talking about him. A lot. In fact, you talk about Adric all the time. Me: As long as I don’t do it in my sleep. Sue would rather watch Varsh instead. Sue: Why didn’t they keep this guy instead – he’s a lot easier on the eye. Can’t act for toffee, though. Sue: Even the other one would be better than Adric, and he’s the campest thing I’ve ever seen in Doctor Who. Sue: He can’t say the word ‘door’ properly. He says ‘deur’. What’s that all about? A Marshchild is captured by the Starliner’s crew. Sue: Aww, it’s cute. I like the twist – we’re supposed to think they’re the monsters, but they aren’t. Not really. The Doctor is introduced to the Deciders. Sue: Please tell me they have revolving chairs, like on The Voice. Yes, a Marshman just decapitated K9. Sue: I don’t believe you. They can solder his head back on. Unless Adric replaces Romana and K9. Noooooooooo! The Doctor learns that the Deciders pretend Mistfall is toxic. Sue: Ooh, it’s a big conspiracy. This is quite interesting all of a sudden. Romana and Adric watch as spiders start bursting out of river fruit. Sue: It’s a good job you were watching Buck Rogers when this was on. I think you would have struggled, Neil. Me: I was watching Doctor Who again at this point. The BBC changed the time slot to minimise the damage Buck was doing to the viewing figures. I think Doctor Who was up against Metal Mickey at this point, and I while I’m stupid, I’m not that stupid. Adric manages to fly the TARDIS all by himself. Sue: What? Can any ****er fly the TARDIS now? Romana ends up with a spider on her face, and we both end up yelping in surprise. Sue: That was another good cliffhanger. The direction was excellent. They actually managed to make a crappy model look scary, and that’s no mean feat. Adric apologises for pulling the wrong lever and accidentally moving the TARDIS. Sue: You flicked a switch! How can you not know the difference between a lever and a switch? Are you sure the blue star doesn’t mean he’s the village idiot, Neil? The Doctor and Login decide to help each other: Login will help the Doctor find his TARDIS if the Doctor helps him find his daughter, which is when the TARDIS materialises in their path, carrying just the person he’s searching for. Sue: What are the chances of that? Meanwhile, Decider Nefred is engrossed in some light reading. Sue: Is he reading the system files? Sue: Or is it the wine list? The Outlers are brought before the Deciders to be judged. Sue: Look at them – hands in their pockets, no respect whatsoever. Throw the book at them. You’re surrounded by them, so just reach out and grab the first one you find. It doesn’t even have to be a book. A ring binder will do. Dexeter experiments on the Marshchild against the Doctor’s wishes. The Marshchild escapes and wreaks havoc in the lab, killing Dexeter in the process. In fact, he only calms down when he notices the Doctor’s face on a monitor screen. Sue: Aww, he thinks the Doctor is his mum. The Marshchild paws at the screen and electrocutes itself. The Doctor is furious. Almost as furious as Sue. Sue: I like it when the Doctor is pissed off. He’s really going for it. Tom Baker hasn’t been this good in a long while. And then the plot thickens – no one knows how to fly the Starliner! Sue: Oh, come off it! There has to be a pilot’s manual. That’s absurd. And besides, Adric could fly it. If he can fly a TARDIS without any training, this should be a piece of piss. Varsh and his mates are put to work replacing components on the Starliner. Sue: What are this lot called again? Sue: Okay, so how many Outlers does it take to change a lightbulb? I’ll tell you. It’s six. One to fit it and the other five to stand around gawping at him as he does it. Me: I think they are doing community service. It’s the Alzarian version of Misfits. Sue: Well, Adric has superpowers – he has healing powers, he’s good at maths and he can fly alien spaceships. What kind of superpowers do the rest of them have? 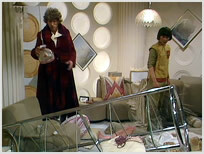 The Doctor and Adric can’t find Romana, and her bedroom looks like a bomb has hit it. Sue: That’s what Nicol’s room looks like on a good day. 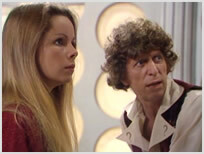 In fact, Romana is behaving very strangely indeed. Sue: Does she turn into Spider-Woman? Does she start crawling up walls and swinging through the studio? I tell you what, though, if they kill her off, there’ll be trouble. At least eight marks off. At least. The episode concludes with Romana allowing the Marshmen to board the Starliner. Sue: Okay, I think I know where they’re going with this. Me: Really? What do you think will happen? Sue: Well, they aren’t the bad guys, that much is clear, so I think they’ll end up working together with Adric, and they’ll fly off in the spaceship together at the end. Sue is losing her patience with Tylos. Sue: Get your hands out of your bloody pockets, lad. And stop slouching! As they congregate outside the TARDIS, Sue blows a fuse. Sue: Shut the ****ing doors! The most powerful machine in the known universe and they always leave the ****ing doors open. You have no idea how much this winds me up, Neil. Me: Oh, I think I have a fair idea. The Doctor keeps the Marshmen at bay with K9’s head. Sue: Okay, this is not what I had in mind when I said I wanted K9 to have a more substantial role in the series. Adric steals an image translator. Sue: He isn’t a very good role model, is he? The only defence against the Marshmen is oxygen, which Varsh and Adric dispense from a pair of cylinders. Sue: SodaStream was massive in the 1980s. Just saying. As the Doctor continues to experiment with the Marshmens’ DNA, Sue finally figures it out. Sue: This is basically Planet of the Apes, isn’t it? They’ve evolved from the Marshmen. I’m right, aren’t I? She did it. She finally did it! Anyway, aside from the odd surface detail (“His bath mat is coming loose at the seams”) Sue enjoys the final act. 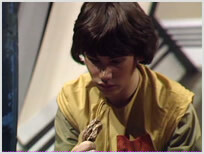 In fact, when Varsh is killed, she even feels sorry for Adric. Me: At least he got to keep his brother’s belt. Sue: If only he got to keep his brother’s looks and talent as well. Adric sneaks back to the TARDIS. Me: And that’s why you should always lock the bloody doors. Sue: Oh, leave him alone. He’s all right. Sue: It’s his dream job – he’s 18 years old and he’s working on Doctor Who. You fanboys are just jealous. I’m sure he’ll settle down eventually. Sue: I bet they can’t decide where to go. And why go anywhere at all? I bet they get shot down by the Daleks. 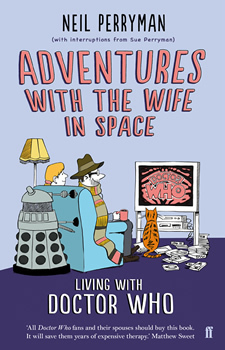 But that isn’t possible because the Doctor and Romana are trapped in E-Space, thanks to a Charged Vacuum Embointment. Otherwise known as a CVE.? Sue: A CV-what? Am I supposed to know what that means? Me: They’re trapped in another universe. Sue: So they can’t return Romana to Gallifrey? Sue: So what happened to Adric? Sue: He was only in this one story? Seriously? Sue: I don’t believe you. I don’t believe for one second that [this section redacted on the advice of our lawyers]! Me: You can’t say stuff like that, Sue! Me: Okay, I admit it, Adric is back next week. Sue: Good. I feel sorry for the actor who plays him. He’s out of his depth, but he’s keen. It’s not his fault. They should have given him more help. Bless him. A little later, we watched Matthew Waterhouse’s appearance on Multi-Coloured Swap Shop. Sue: He is so adorable. Me: You’re taking the piss. Sue: I’m not! He’s so into it. You can tell he’s a fan. I bet he pinched himself every day when he turned up for work. Actually, now that I look at him, he reminds me of Matt Smith. Sue: It’s that wide grin of his. He’s so cute. Sue: I enjoyed that. The direction was excellent, some of the ideas were very interesting, and the acting was pretty good, too. And I liked Adric. So there. 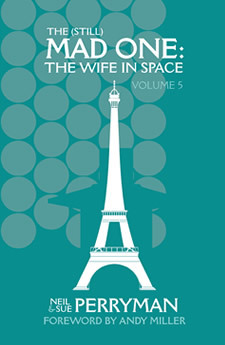 Volume 5 is packed with extras, including Buck Rogers in the 25th Century and a Big Finish Audio Adventure (exclusive to this book), episode annotations, illustrations by Graham Kibble-White, and a foreword by Andy Miller. Go behind the scenes of the blog with this book from Faber and Faber. © 2018 Neil and Sue Perryman. All rights reserved. Doctor Who is copyright © BBC and no infringement is implied or intended.